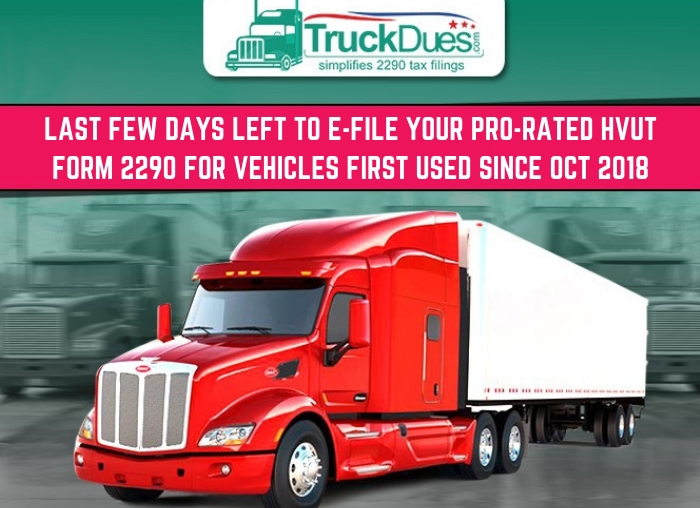 Last Few Days left to E-File your Pro-rated HVUT Form 2290! This entry was posted in 2290 e-file, American Trucking, EIN, Form 2290, Truck Tax Online and tagged +2290 +tax +efile, 2018 - 19 TAX 2290 TAX PERIOD, 2018 - 19 VEHICLE USE TAX, 2018 FEDERAL TRUCK TAX RETURNS, 2018 TAX 2290 RETURNS, 2018 TRUCK TAX ONLINE, 2018 TRUCK TAX RETURNS, 2018 TRUCK TAX RETURNS EFILE, 2018 TRUCK TAX RETURNS ELECTRONIC FILING, 2018 TRUCK TAX RETURNS ONLINE, 2290 ADVANCE FILING, 2290 deadline, 2290 due date, 2290 DUE FOR 2018, 2290 DUE NOW, 2290 FILING DEADLINE, 2290 FILING DUE DATE, 2290 FORM COST, 2290 PRE FILE, 2290 PRE-FILING, 2290 PREFILE, 2290 proof of payment, 2290 renewal, 2290 TAX DUE NOW, 2290 truck tax, 2290 UP FOR RENEWAL, CHEAPEST 2290 E FILE, EFILE 2018 - 19 TAX 2290 on November 29, 2018 by Truck Dues. Makes e-file possible for every trucker! This entry was posted in 2290 e-file, 2290 for TY 2014 - 2015, American Trucking, Form 2290 and tagged +2290 +tax +efile, e-file 2290, Tax 2290 Dues, truck tax dues on August 5, 2014 by Truck Dues.